All transactions are safe and secure with a reliable history in online purchasing behind each of our associates. 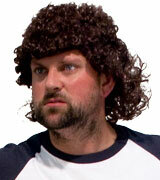 Buy the Kenny Powers Wig to own Eastbound and Down clothing and merchandise. There is no better way to become the major league legend than with a Kenny Powers mullet wig. This version is perhaps the best for your money, as it more closely resembles Danny McBride's hair than do more expensive versions on the market. There is a slight reddish tint but it still looks great, especially when paired with the jersey above to create the perfect Kenny Powers costume. In addition to the Kenny Powers Wig above, browse the Eastbound and Down Clothing Gallery for more apparel like men's and women's clothes, kids shirts or hoodies.